Our Best Dungeon tournament continues with two new titles. 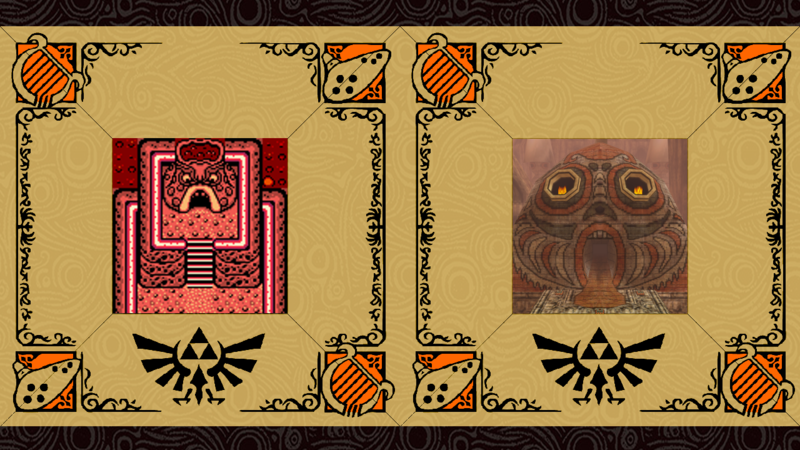 As Turtle Rock and Arbiter’s Grounds duke it our in yesterday’s poll, our first Wild Card winner takes on the winning dungeon of Majora’s Mask. The Sword & Shield Maze earned a healthy victory against Four Swords Adventures‘ Temple of Darkness in the Wild Card Round, earning a spot here in Round 1. Let’s see how this dungeon will fare against our newest challenger. The Stone Tower Temple needs no introduction. The crown jewel of Majora’s Mask, this dungeon holds a number of twists, turns, and memorable moments. Link must prove mastery over every tool and transformation he’s picked up along his quest. And when he thinks he’s reached the end of the temple, our hero finds the Light Arrows and uses them to flip the temple upside down, opening up another half of the dungeon. These experiences — along with an interesting atmosphere, exciting boss encounters, and great music — will help give this dungeon an edge in our tournament. Who will complete both Oracle Games first?